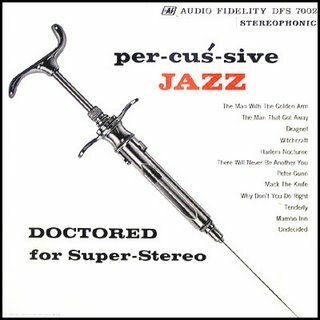 LISTENING NOTES: Shooting High: Audio Fidelity's "Percussive Jazz"
Shooting High: Audio Fidelity's "Percussive Jazz"
Audio Fidelity was one of the first "audiophile" labels, well before the term came into general usage. They were also the first to bring the stereophonic record to the public. The label's big sellers were The Dukes of Dixieland, and a library of sound effects lps. The format of this release echoes the highly influential Command label releases "Provocative Percussion" and "Persuasive Percussion", created by band leader and sound pioneer Enoch Light". Heavy duty laminated gatefold jackets with bold graphics were pushing everything percussive for several years. Inside the jacket, you would always find a track-by-track commentary, pointing out the instruments used, the unusual arrangement, and "what to listen for" that would demonstrate your systems ability in the various parameters of high-fidelity stereophonic reproduction. This release falls partially into the "crime-jazz" genre, what with themes from Peter Gunn, Man with the Golden Arm and Dragnet, but then other cuts like "The Man That Got Away" and "Tenderly" and "Mack the Knife" take it elsewhere. The lack of an overall direction is the first major downfall for this LP. While the sound is very good, it isn't outstanding and falls way behind the results that RCA and others had been achieving in stereophonic recording two years earlier. Throw in the cheesy stereo effects sprinkled throughout, and you've got a dud. Unfortunately, "Percussive Jazz" is a big disappointment.